Geese change patterns under a full moon. Canada geese were pouring into Teddy Carr's spreads, and his clients were dropping birds at will. Dozens of flocks filled the skies each morning over the course of several weeks, and Carr, a guide from central Virginia, was careful to shift his hunts around to avoid pressuring birds on the same farms. But even with such calculated strategy, the flood of geese turned into a flow, which then dwindled to a trickle. In a matter of days, the unbelievable morning flights on farms throughout his territory virtually dried up. Carr wasn't pressuring individual fields, so he wasn't exactly sure why the abundance of birds suddenly disappeared. "I went back for an afternoon scouting trip just to see what was going on and while I was walking through a field looking for fresh sign, I heard a flock of geese," he recalled. "It was coming right for me, so I just ducked down and waited. Before I knew it, there were 1,500 to 1,700 geese in the field I was in and in the neighboring fields." Carr called the clients who were scheduled to meet him early the next morning and shifted the hunt to the afternoon. It took some coaxing, but the hunters finally agreed. That afternoon hunt turned out to be one of Carr's most memorable days in the field, as flock after flock piled into his spread. He immediately shifted half-day hunts from mornings to afternoons, and for the next several days, clients burned through boxes of shells and killed geese. Carr's action might have gone stone cold as a result of hunting pressure. The central Virginia guide experienced that memorable hunt toward the end of the season, and while the birds don't get a huge amount of pressure on the private farms, they are hunted regularly. Carr avoids overhunting individual farms, so he figures the geese simply started feeding at night to avoid hunting pressure. During full moon periods, afternoons often provide the best goose hunting action. The primary reason, however, had more to do with the moon phase. When Carr scouted that afternoon when hundreds of birds descended upon him, he didn't leave until virtually every trace of daylight was gone. That's when Carr noticed a beaming full moon, a night light that allowed him to walk through field without the aid of a flashlight. "I finally figured out that geese were waiting until the afternoon to fly out to feed on a full moon," he said. "They were just sitting all day until three or four." 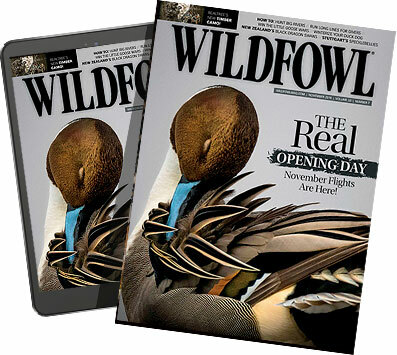 Alex Langbell, a videographer and former waterfowl outfitter from Washington's fabled Columbia Basin, has encountered similar behavior. When a bright moon greets Langbell at 4 a.m., he knows it will be a long morning. Like Carr, he discovered geese will wait until late afternoon before they fly out to feed. "I've walked into birds already in the field an hour before first light because they are out there feeding under a full moon. At first, I didn't really understand what it all meant, but I started putting everything together," said the 41-year-old professional firefighter. "If there is a little snow on the ground and the sky is real clear, it's almost like daylight, so it's no surprise geese shift from daylight activity to nighttime activity." In some ways, the full moon can be a goose hunter's friend, says South Dakota resident Tyson Keller. Just as geese feed at night under a bright moon, they also migrate, bringing new waves of birds. "Areas that didn't have many birds all the sudden had thousands. Once the geese get back to their normal routines, the hunting can be fantastic," he said. "I've also had some incredible afternoon hunts two or three days on either side of the full moon." Heavy cloud cover during a full moon seems to negate the night-feeding behavior of Canada geese. The moon is truly full for only a day. Before and after that day, it's close enough to full to allow the geese enough light to fly and feed at night. Or perhaps the moon's pull has some other influence we simply don't understand. Whatever the reason, goose behavior is clearly different around a full moon. Carr says the high afternoon activity can lead to phenomenal hunting, but it can be too tempting to overhunt individual areas. He and Langbell are fortunate to have plenty of fields, but caution hunters with limited options to plan just one or two full moon hunts per moon phase to avoid overhunting the same birds. "They definitely are more sensitive to evening pressure than morning pressure. I'm not real sure why that is, but they won't come back to a field that's been shot in the evening for a long time," Carr noted. Although Carr and Langbell tend to use the same amount of decoys in the evenings as they use on morning hunts, Keller increases his decoy count to as many as 10 dozen. He says Canada geese that move later in the day tend to congregate in larger flocks, so large spreads help coax them to the ground a little better. "I also call quite a bit more aggressively in the afternoon," Keller said. "They are much more vocal, and I try to mimic what they are doing." All three experts discovered hunting geese on the morning of a full moon is a long shot, at best. Carr has a difficult time explaining to his clients a morning in the blind is likely a pointless endeavor and it might be wise to hold off until the afternoon. That doesn't always go over so well, which means he has spent long mornings staring at empty skies. That is, until the afternoon rolls around and the birds start flying. Carr rarely sets out a spread during a full moon until around 2 p.m., if he has the option. Same with Langbell. Even Keller, who hunts 100 days per year, often waits until after he has eaten lunch and run a few errands before he starts hunting around a full moon. But not always. appens, then I'd recommend figuring out where they are roosting during the day and getting there before they do," Keller said. "The birds may sit in a field for several hours after feeding all night under a full moon, but they are going to get up and head back to water eventually." In many ways, their daily habits are reversed. Instead of roosting at night and feeding during the day, geese loaf in the daytime and then feed at night under a full moon. Keller is a big fan of water hunts in the mornings after a full moon, even sheet water in a field that might otherwise be dry. Puddles in grain or other feed fields, however, can keep geese stationary all day, and in some cases, they might not leave at all, especially if enough water is available to keep their feet wet and give them a drink. If the birds don't have that option, they will likely travel to water sometime in the morning. "Sometimes they'll go out to the middle of a big reservoir and there isn't a thing you can do about it. Your only hope in that situation is to pray for a good strong wind that keeps the birds off big water and forces them to find shelter against a lee shore somewhere," Keller said. "If you can find that, you can have a pretty good morning hunt after a full moon." Afternoon hunts using larger decoy spreads is a common strategy to combat the impacts of a full moon. Plenty of areas don't have a massive lake or saltwater estuary nearby, so geese are forced to roost on ponds or rivers. A farm pond can be a dynamite place to hunt, although the notion of hunting a pond, especially a daytime loafing pond, is a contentious issue among many waterfowlers who feel shooting a roost pond is nearly criminal. Carr tries to limit roost hunts to the early resident season and the final weeks of the general goose season. The morning after a full moon, a pond can be an incredible place to set up, especially if it is ringed with short grass that gives the birds a chance to graze throughout the day. Hunting a roost pond in the morning or a few hours after sunrise can be hit-or-miss. Thorough scouting can mean the difference between success and utter failure. But even scouting isn't always foolproof. "I've had a lot of cases where the birds beat me to the pond even though I was there before first light," Carr said. "They will feed at night, but fly back to their roost pond when it's still dark. I'm not real sure if there is any way around that. Sometimes it just happens." When he does beat them to the roost, Carr favors small spreads because he simply doesn't need to use a large one in that situation. Morning geese often filter back to their roost in small flocks. He'll throw out a handful of floaters on the water and set out a few full-bodied decoys on the pond bank. How many decoys Keller uses depends on the situation. It's not uncommon for the areas he hunts to hold thousands of Canada geese, so larger spreads are the norm. He's a big fan of rivers, especially later in the season when still waters are frozen. He says geese that use rivers tend to be more restless, especially under a full moon, and relocate more than birds that loaf on a pond or in the middle of a large lake. He'll use up to six dozen decoys, with four dozen of those floaters in a pocket of calm water below a sandbar or island. The rest are a mix of shells, mostly sleepers and resters, placed at the water's edge. "It can pay off to be out there in the middle of the day, even on calm, warm days. If the geese have been feeding all night and loafing most of the morning, they may get up and stretch their wings, or something may spook them off their loafing area," Keller said. Toss the entire night-feeding pattern out the window if there is heavy cloud cover, because it eliminates the full moon night-light advantage. Keller quietly prays for an approaching storm or at least a heavy layer of clouds to snuff the bright light. If he gets his wish, Keller simply shifts back to morning hunts and pays more attention to food sources than roost sites or loafing areas. "Weather can trump the moon phase because the birds just can't see very well when it's cloudy at night so they are less likely to fly," he said. That's also true during the various other moon phases. Although geese will fly under absolute darkness, it is rare, and they are probably migrating or traveling from one roost site to another. Typically, Keller doesn't see much change in goose activity or behavior when the moon is in various other phases. "It's hard enough trying to figure them out during a full moon," Keller said. "I'm glad we don't have to learn new patterns and hunting techniques for the other moon phases." David Hart is an avid waterfowler from Rice, Va.